The newest betting millionaire in town stunned journalists on Wednesday after he claimed that he dreamt of President Uhuru Kenyatta’s victory in the forthcoming elections. 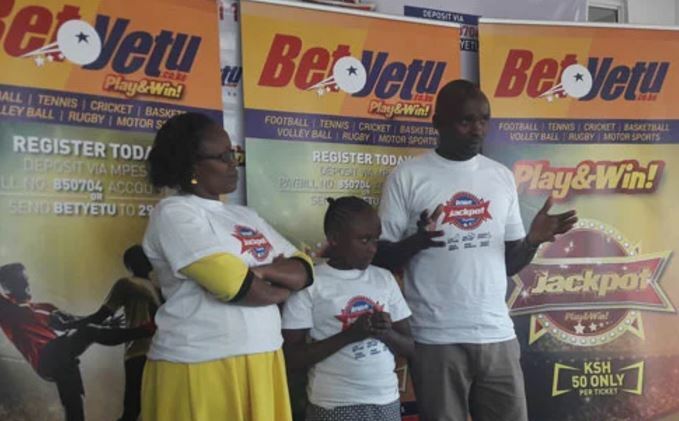 Edwin Kiarie Muniu was speaking after being unveiled as BetYetu’s first ever jackpot winner for correctly predicting the results of 13 football matches. He won a cool Sh 12 Million. “This is a dream come true. I actually dreamt that I had won a lot of money. I even shared this with my wife, ask her,” Kiarie said. Kiarie who was accompanied by his wife Maureen and 10-year-old daughter Melissa added that he also dreamt that Uhuru Kenyatta would be re-elected and that Sonko(Nairobi) and Ferdidand Waititu alias ‘Baba Yao'(Kiambu) would also secure victories in August. “I also dreamt that President Uhuru (Kenyatta) had been re-elected and he was there taking oath of office again, same to (Mike) Sonko and (Ferdinand) Waititu. At the time, I was wondering what kind of dreams they were. But now it is making lots of sense,” said Kiarie. Who said dreams don’t come true? Wait a minute. Is it fair for those who make prophetic utterances and dream dreams about things before they actually happen to win betting jackpots? I mean wouldn’t that be like cheating if you know things before they happen because you have visions? You bet your bippy that Betyetu should look into that if Uhuru wins. They might be dealing with a fixer.